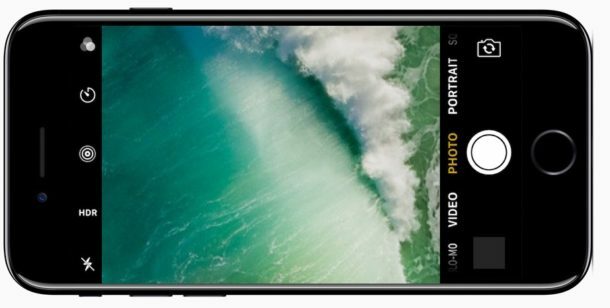 Ever since Apple redesigned the iOS lock screen to remove swipe-to-unlock and require users to press the Home button instead, some iPhone users have discovered that accessing the Camera from the lock screen might be a challenge. The potentially difficult scenario is this; if you press the Home button to show the locked display which you would then swipe to access the iPhone Camera from, pressing the Home button also unlocks the iPhone and skips the lock screen with the camera access. I recently ran into someone who was convinced this set of actions meant their iPhone lock screen camera wasn’t working or no longer existed, so the behavior can lead to some degree of confusion as well. Fortunately there’s a better way to access the iPhone camera from the lock screen in iOS 10 and newer, and it doesn’t involve using the Home button at all. This is going to require you to change your habit a bit, and when you want to use the camera on iPhone from the lock screen, you’ll be pressing the power button rather than pressing the Home button (which unlocks the iPhone rather than show the lock screen). Don’t press the Home button, since that is going to attempt to unlock the screen. Instead, get in the habit of pressing the Power button to simply show the screen instead. Alternatively, you can use Raise to Wake to show the lock screen on iPhone instead. 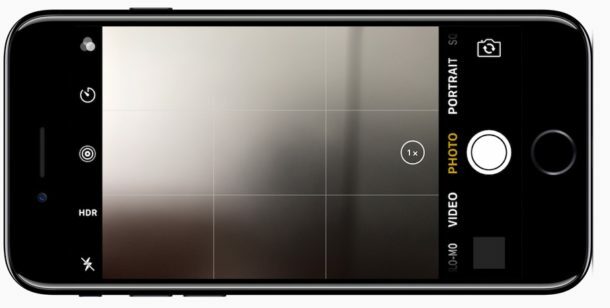 Once the iPhone screen is visible, perform the usual swipe-to-access camera gesture. Now you’re in the camera and ready to take pictures, from the lock screen. Fast and easy. Hooray! Now you have accessed the iPhone camera from the lock screen, without having to press the Home button which also unlocks the iPhone to send you to the Home Screen. Yes this requires changing your iPhone usage habits slightly, it’s mostly getting used to pressing the Lock / Power button instead of the Home button to show the display. But once you get accustomed to the change, this is now the fastest way to access the iPhone camera. If you’re more verbally inclined, you can also get to the iPhone camera without ever touching the screen by using Siri instead too. Even now that it has been released for quite some time, some iPhone and iPad users might continue to struggle with the redesigned lock screen in iOS, old habits are hard to break sometimes. If you fall into that group, you can disable Press Home to Unlock in iOS and disable widgets on the lock screen in iOS which might be helpful, and though that won’t offer a return of the iconic slide-to-unlock action, it could make the lock screen a little less confusing for some users. Don’t forget you can also disable the iPhone camera completely including the lock screen camera if you want too as well. Nice tip! I use a variation of this which is to use Raise to Wake and then I swipe to show the camera. It makes it a single gesture of just raising the iPhone up and swiping. Once you get in that habit, it’s really fast. Repeat it a few times and you’ll see what I mean. I do wish they would offer a setting to re-enable Slide to Unlock though. My family members who have updated to new iOS are still so confused by it. Slide to unlock was very natural and intuitive, it also might have been friendlier to accessibility users. Yeah I thought of the raise to wake approach when I read the article and I’m sure the authors know about it too, but wanted to provide a more general solution. The method described in the article works on any device running iOS 10 including older iphones, ipads and ipod touch, whereas the raise to wake feature is limited to iphones and only available on iphone 6s or later models. regarding the removal of slide to unlock, I totally agree. My mom happens to be one of those people who have trouble getting rid of the old habit. And since she often has notifications on her lock screen, she accidentally opens one every time she slides her finger on the screen out of habit, and then ends up in the app that triggered the notification instead of the home screen, wondering what the heck happened. The raise to wake feature, which I thought of too and I’m sure the authors knew about, is a more limited approach because it is exclusive to iphones and only works on the 6s or later models. The method described above, however, is more general and works on all devices running iOS 10 including ipads, ipods and older iphones. Just lifting the newer iPhones up towards viewing position usually momentarily reveals the lock screen. Then the camera access swipe can be performed without the need to press any buttons. yeah it’s called raise to wake. But it doesn’t work on older iphones or other devices such as ipad or ipod touch. The method described here works for all devices running ios 10. Android is just so much easier to unlock or quickly unlock to the camera app. They’ve copied so much already from Android, why not copying that as well? I have the SE and raise to wake and swipe right to left opens the camera with no buttons at all to push. I use a better way to access the camera from the lock screen. 1. Swipe Left. Camera appears. 2. Tap the volume button. One picture is taken (no Bursts). Camera can be rotated to place the volume button in most convenient location. Tried it… but I had a ‘notification’ I had to clear first. So, it wasn’t as straightforward, unfortunately. The ‘other’ thing I’ve always found annoying, is even if you DO take a photo, to ‘do’ anything with the photo, like actually ‘see’ how it turned out, you still have to ‘unlock’ the phone… so I see this as a ‘false economy’ and only really for those – ‘shoot from the hip’ moments…. which, if you have a notification to clear first…. the whole plan falls in a heap…. This change isn’t ergonomic. The former slide up to unlock was sliding a thumb upward toward fingers holding the iphone from the top behind the phone. When using your right now now you’re swiping out of your palm with your thumb to nothing holding it out of the side of your hand. If you were to do this really fast you could be swiping your phone out of your hand trying to open the camera. I really hate this change. OK, I’ve taken my pictures and want to get back to the lock screen. Any way to do that other than hitting the power button twice?